Learn the advantages of being over 50 and learn to harness them! When conducting the job search…that famous line immortalized in one of my favorite movies…Glengarry Glen Ross spoken brilliantly by Alec Baldwin and heard a billion times over in sales training and sales meetings all over; applies so well to the job search. Glengarry Glen Ross, a movie about a group of real estate agents struggling to close deals…adapted from David Mamet's award winning play, the film showed the struggle and desperation often felt by salespeople and business. When the company brings in a sales motivator played by Alec Baldwin teams are setup and compete in a contest. The winning team receives prizes and the losing team will be fired – talk about anxiety! Glengarry Glen Ross teaches us some great lessons in the job search, as we are really selling and marketing ourselves to potential employers. In the movie the sales teams complains throughout that the leads they are given are "wood" - a waste of paper, waste of time, unqualified. 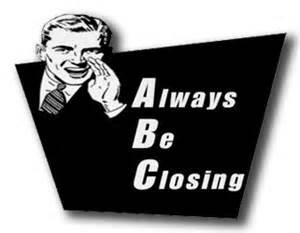 The bosses at the company claim it is not about the leads, it is about the salesperson, their skill, and the art of closing (This movie coined ABC - Always Be Closing). There is a big difference between a lead and a "Qualified Lead." In order for a lead to become a qualified lead one must understand what the lead is, what is the current situation, what are the requirements? Out of the four sales representatives in the movie, Al Pacino's character was the only one closing deals, making money and doing business. That was because he fully understood to whom he was are selling to; so you too must clearly understand to whom you are “selling” yourself to by “listen” to them, and truly learn their pain points, and show them the value you bring to the table and how you can solve their problem. Spoken by Alec Baldwin’s character Blake. The effort, confidence and savvy to sell is an admirable treat, but can also often be very daunting. While you MUST show confidence, you do not want to come across as pompous and arrogant – that will NEVER get you anywhere and can portray you as someone hard to manage, and someone who may not be a good mentor or teammate. Finally, those immortal words from Baldwin’s character are very nearly comical in the movie, but the sentiment is very real. Before entering any interview (whether in-person or on the phone or via Skype), know what your ask is, envision what you would consider a success would look like. Perhaps it is a follow-up interview; perhaps it is a formal job offer…the singer Toby Keith sings, “if you don’t know where you’re going…You might end up somewhere”. 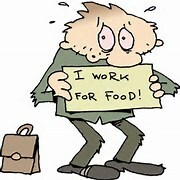 In addition, the job search for those of us over 50, as discussed throughout this website, is more difficult…not only are we over qualified for just about everything, but we have often been earning more money than many of the jobs for which we are applying. Also having to face that daunting question about why we would be willing to "take a cut in pay" is a hard one to answer when we feel we are worth the extra money, but the truth is that if you are not working any job is a 100% increase. By age 50, you know many people in your industry, profession, and/or community. If you have not already contacted some of these people, do it now! Because of your age and experience, you have many more options and a much better network of colleagues than your younger competition. Your network of people who know and respect you, a network built up over the years will help you succeed with the job search. Many opportunities, and usually the best ones, are pretty much never advertised and this is where your deep network comes into play and becomes a very big advantage! Employee referrals are most employers’ NUMBER ONE source of external hires. There is a good chance that people in your network are either also looking for work, or know someone who is looking for good help…so you can help each other to move ahead with your careers and renew old friendships, too; and not feel like you are “using anyone” in the process. Take advantage of that large network you have to track down that next job. Contact the people that you know and/or have worked with in your career. By age 50, you know many people in your industry, profession, and/or community. If you have not already contacted some of these people, do it now! Practicing your 90-second elevator speech so you can explain in simple terms what it is you do and how you do it – committed to memory and you will be primed for good results in the job search. 1. 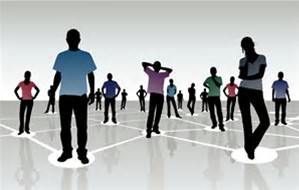 Professional networking site LinkedIn (free) has become very useful in finding former colleagues and helping you reconnect. Build out your LinkedIn Profile as a resume, connect with your friends and colleagues who are also using LinkedIn, exchange recommendations, and join LinkedIn Expert Groups to demonstrate your knowledge and connect with more people. 2. If you have helped anyone get started in your industry or profession, helped them with their job search, or done them a favor, that is another group of contacts to explore. LinkedIn may help you find those people as well…and do not forget about Facebook for tracking down past colleagues. 3. Belong to any school or business "alumni" groups? Colleges and universities have had them for years, particularly the schools supported by donations, and now groups are developing based on common background working for a specific employer. Contact your schools (high school through graduate schools) to see what alumni services they offer. 4. What about any clubs, professional groups or industry organizations? Keep going to those meetings; visit the web sites. Some organizations have jobs posted for their members (or by members for the public). 5. Many job search groups – often associated with church or community support/resource centers, provide another way to extend your network, as well as, a way to stay in-touch and learn new things about your local job market. If your network does not have any good leads, you can always check out sites for opportunities. There are also job sites specifically for people over 50, like Workforce50, SeniorJobBank and Seniors4Hire where employers are actually seeking reliable people with experience. Indeed.com and Monster.com and many other more specialized sites like Dice.com can be extremely useful. Every state in the U.S. has a state, and many local government agencies have employment resource offices that offer help for people out of work, including training and job counseling. If you are a Vet, your local Veterans Administration office may also be helpful and offer support as well. A job search, especially for those of us over 50, is never easy, but you will make it – I know, I’ve been there and done that several times over my long career. However, and I cannot stress this enough, the solid skills, your deep and vast network, expert been-there-done-that experience and maturity are all key weapons that your younger competitors CANNOT compete with…and are solid keys that will see you through – learn to embrace them and learn how to leverage them here on UberCareerTips.com!